John Steed drove two vintage Rolls Royce cars during series six of The Avengers, but he already owned a Rolls Royce in series one and series two of The Avengers. Unlike his cars in series 6, this one is not a vintage model, but a Rolls Royce Silver Cloud II. The Rolls Royce appears in a small scene of the series 1 surviving episode Tunnel of Fear. Steed parks the vehicle in front of Dr. Keels surgery (a building at Markham Square, SW3), and when Steed runs after his dog Puppy, Harry Black drives away with Steed's car. The car has a light color, it could be silver. Unfortunately one does not have a clear look at the license plate of the car.It ends with three numbers: 550, I would read the letters as MVD. The car was mentioned on other occasions. That’s the last “appearance” of this Rolls Royce in series 2. More information that Steed has the Rolls Royce owned earlier can be found in the scripts of "The Strange Case of the Missing Episodes," such as in series 1 episode Please Don't Feed the Animals (108) where Steed and Dr. Keel are talking about the car. 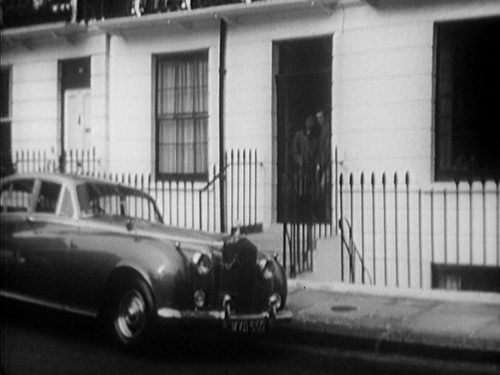 The car is also mentioned in Ashes of Roses, where the Rolls Royce is parked outside Steed's flat and when he drives to Colliers Park Gardens with Carol Wilson (92, 95) and in Double Danger where Steed pulls up in a Rolls Royce (189) and in episode Kill the King (234): "Got the Rolls here?" The car is also in Hunt the Man Down : "Not the usual Rolls Royce" (108), and it got damaged in Diamond Cut Diamond where Steed’s car radiator has been bent askew, one of the front wings is dented (no car marque). 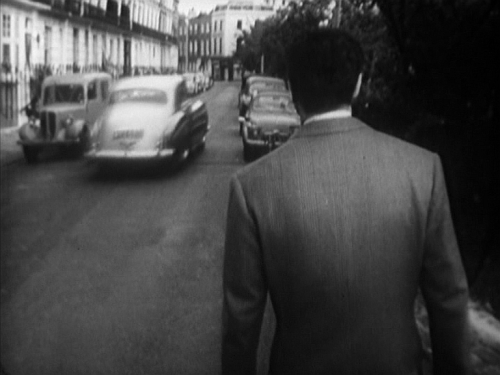 And it's mentioned in Toy Trap again (203), where Steed lent his car to one of his girlfriends. June 22, 2014: Richard McGinlay, one of the writers of The Strange Case of the Missing Episodes and the website The Avengers Declassified, wrote a mail and told me that the information about John Steed's first Rolls Royce in the episodes Ashes of Roses and Please Don't Feed the Animals are an educated guess of the authors Richard McGinlay, Alan and Alys Hayes of The Avengers book The Strange Case of the Missing Episodes (Hidden Tiger, 2013), but are not specified in the scripts. However the appearance of a Rolls Royce is a likely one, although later scripts of Double Danger, Toy Trap, Kill the King do specify a Rolls Royce too. Richard McGinlay pointed out that the car and Steed's flat are also mentioned in Leonard White's Series 1 guidelines, a reminder for the writers of the series. White wrote that Steed's flat was an indication of his 'special' tastes and that John Steed's car was indeed a Rolls Royce. And indeed the car wasn't a phantom. We got a first look at the car at the Birmingham screening of the long lost episode "Tunnel of Fear" in October 2016. A visitor of the website informed me that the Rolls Royce MVD 550 also appeared in the Britsh film "Play It Cool" (1962) as the car of Sir Charles Bryant (Dennis Price) in a scene at an airport (I guess it would be Gatwick).